My YA fantasy, Dreammare, moved onto the third round of Adventure’s in YA Publishing’s Red Light/Green Light competition! That means I’m in the top ten! Read the opening page here. This week, I also wrote in BB, which is my second attempt at a contemporary YA, but I only have the first chapter done. I definitely believe in the story, but I’m not sold on myself writing it yet. Sometimes, we need more tools in our pocket before we can build something, and that might mean twenty more weeks of research for this bit. In bigger news, I’m DEFINITELY writing the next Bad Bloods book. Because of your raving reviews, Clean Teen Publishing already gave me the thumbs up to continue the series, and since I already have a draft from when I was 12 (eek! It’s terrible), I’m really excited to tackle this rewrite of an old project, too. So far, it’s titled July Thunder / July Lightning (but I’m aiming to make this one book instead of two). It takes place in July of 2090, and it will be told by two different characters, one of which you’ll recognize from November Rain and November Snow, and another who is completely new to the series. I’m 7,350 words in, three chapters deep, and working on the outline extensively. So far, the biggest hurdle is letting go of the focus of some of the original characters and allowing the current protagonists to focus on themselves and their story. You will see the members from the old cast as well as completely new characters and sections of Vendona. Most exciting of all will be an emphasis on Eastern Vendona, which I’ll talk a little about below. Photo by The Bookworm Who Lived! We’re two days away from the book release of Bad Bloods: November Rain! I’m DYING from excitement. In fact, yesterday, Clean Teen Publishing let me know that we’re already on a second print run, even though the book isn’t out yet! This is big news. So, thank you for your support! What are the latest readers already saying? I finished The Last Star by Rick Yancey, and UGHHHHH, I’m so incredibly torn up after finishing this trilogy’s finale. It’s fantastic, it’s heartbreaking, it’s thrilling, and it’s…incredibly frustrating. I love how symbolic Rick Yancey’s voice is. I love how diverse his characters are. I love how REAL his sci-fi, apocalyptic alien takeover feels. And I think the ending was perfection. It was flawless. I don’t want to spoil anything, so I’m going to leave it at that, but if you haven’t started this alien sci-fi trilogy, pick up The 5th Wave today and check it out. It’s a thrilling ride you won’t forget. Recommended to sci-fi lovers who enjoy apocalyptic settings, alien takeovers, and mind-blowing twists. Must love metaphors. Must love numerous POVs. Must love surprises. Favorite Quote: For some, death is the midwife to faith. For others, it is faith’s executioner. Read my full five-star review by clicking here. Okay. Okay. I’m FINALLY listening to the Serial podcast. I’m only on episode three, but holy bejeebes. I’m addicted. Speaking of addictions, I spent nearly all my free time watching Good Morning Call on Netflix. (Seriously. Each episode is 45 minutes long, and I finished all 17 episodes this week. I couldn’t stop myself. Not even a little bit. My writing time suffered, and I don’t even regret it one bit.) Good Morning Call is a Japanese romantic drama show based off a manga I’ve actually read, and I LOVED it. It’s super cheesy, it’s super ridiculous, and it’s super hard to stop watching. Even parts where the feminist inside me cringes, I have to admit I love. It’s such a guilty pleasure that I highly recommend, though you must be willing to read captions. The story follows a high school girl who finally gets her own apartment only to realize she’s been caught up in a rental scam and must room with the worst lover boy from her school…though maybe he’s not so bad, after all. Kiki and I were pretty in pink this week on Instagram. So, do you all have reoccurring rooms in your dreams? I do. Which I’m not sure is normal or not. But I have this one room that (and this is going to sound stalkerish, because it is) that is dedicated to Lily Collins. (WHAT? I love her. SO WHAT?) So, I visit this room in my dreams, for some reason, and it’s just filled with fan art, but this time, it was destroyed, and I was distraught, so I picked up what I could, and then, as I was leaving, I realized the back lights were on…which is weird. Because these lights have never been on. Then, I remember I’ve “sold” this room (apparently in a dream I can’t recall), and the new owner is there WITH AN AXE. So he hits me on the head. My new author photos are on the way! But I can’t believe we’re only two days away from the Bad Bloods book release! Thanks for your support! Personally, I’m not an audio book person. Not yet. But I have found another stream of entertainment through audio programs, and they help with my writing. So, how do I recommend getting involved? There are dozens of podcasts dedicated to writing, publishing, and everything in between. Personally, my favorite has been Writing Excuses. The recordings are clear, the hosts are fun, and the topics are relatable but also challenging. I often find myself nodding along to everything they say, but then, they say ONE little thing in a way I’ve never thought about it before, and my entire afternoon is fueled with excitement. This is my favorite podcast of all-time. Highly recommended for every writer out there, no matter where you are in your writing career. As every writer, I research. A lot. But I don’t always have hours and hours of time to research. So, I searched for a podcast with mythology and classical stories to listen to. This is more for inspiration than anything else, but it helps me take a break, have fun, and educate myself (or even refresh myself) on the mythology out there literature uses to create. It also feels like a reprieve from work, even though it isn’t. This is an expansion on #2, but basically, I didn’t just want to be inspired; I also wanted to be challenged. So, in this example, I challenged myself to listen to a podcast on Japanese mythology. Granted, I’ve already had some interest in this field, but it’s more difficult for me to get involved since I don’t have a huge background in it. By listening to it more, especially while contrasting it against western mythology, I can challenge myself to find inspiration in topics I wouldn’t normally find outside of that podcast. These are three simple ways you can use podcasts to help with your writing. I hope you have just as much fun as I have! I’m starting a new series called “Author in a Coffee Shop.” If you’re wondering what Author in the Coffee Shop is, it’s just how it sounds. I sit in a coffee shop and tweet out my writer thoughts while…you know…I people watch…for inspiration. Follow me on Twitter via @AuthorSAT next Friday at 7 p.m. CDT for episode 2. In other news…you can now add Bad Bloods to Goodreads: November Rain and November Snow. I’m also considering leading up to the July releases with short stories of each character joining the “flocks.” A flock is a group of 12 bad bloods that have come together to survive on the streets. In Bad Bloods, there are four flocks, one for each cardinal direction of the city, but only two flocks are left: The Southern and the Northern Flock. Some stories would purposely be left out, but I have six written. If this is something you’d think you’d be interested in reading, let me know! I would start sharing them at the end of February. Speaking of February, on February 13, I’ll be one of several featured authors at a Barnes & Noble Valentine’s Day Romance Author Event in Wichita, Kansas. (More info to come.) I’d love to see you at Bradley Fair! Also, my awesome publisher is giving away a Kindle Fire right here. I added a YouTube page to this website, so you can catch up here as well as on YouTube. I am expecting to upload my next video soon, but I’ll always make an announcement. If you subscribe to my channel – Coffee and Cats – you can watch all of my videos one day early. I know. I know. A desk can be a clattered mess, a scattered collection of book remains, an abyss of wonderment, the aftermath of a chaotic genius. Chances are your desk is already filled with pens, photographs, and paperwork. The last thing you need is more trinkets. Right? Wrong. Every time I think this, I am wrong. I love trinkets. I love trinkets too much. I do not think my love for trinkets will ever stop. And today I am sharing a few of mine that I haven’t shared before because they help me during my every day stresses and excitement. In other words, the little things remind me of the important stuff – the feelings that make me work harder and smile longer – and I hope you might consider adding a positive reminder to your desk and/or share the ones you already have. Fun fact: I’m obsessed with meanings behind things. Whether it is the meaning of a name or the meaning of a certain type of flower, I could spend hours reading about how certain labels came about. Tiger’s Eye is my favorite stone. They are beautiful, but they are also associated with protection and clarity. Below, you’ll see two Tiger’s Eyes that I keep on my desk. 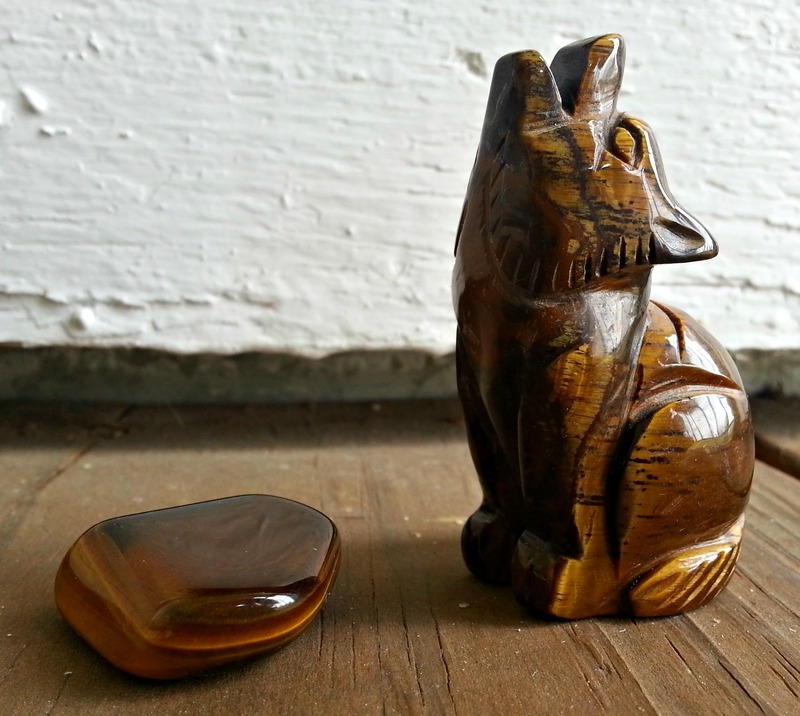 One is a stone I was gifted, and the other one is a statue of a coyote that a very kind woman carved for me after my husky passed away in 2007. These stones remind me of many things, such as my love for my dog, Shadow, but they mainly remind me of the clarity I believe in that I am doing the right thing by following my dream as well as the protection I receive from all of my loved ones, passed on and still alive. 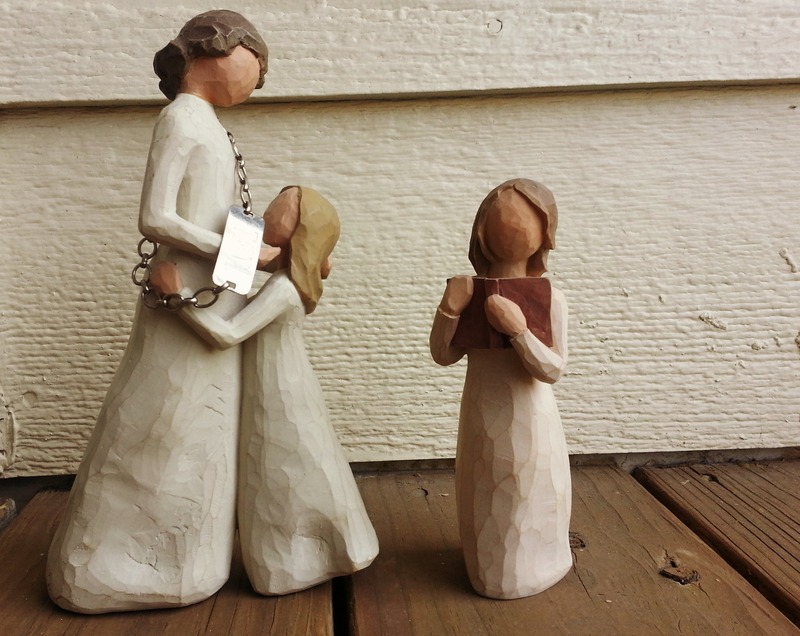 Obviously, I have a thing for statues, but Willow Tree (Demdaco) is one of my favorite companies. These are two gifts I received which both happen to be by Willow Tree. The one on the left is known as the Mother and Daughter. I received this from my aunt right after my mother passed away. I have my mother’s bracelet draped around the statue, because I used to wear it every day until the clasp broke. I considered fixing it, but I almost lost it, so I decided to keep it on my desk instead. The one on the right is the Love of Learning. This was given to me as a birthday gift from a great friend who is actually in the acknowledgements of Minutes Before Sunset. She’s always been so supportive of my novels. In a way, both of these statues remind me of the loved ones in my life that support my dream as well as all of the love that surrounds me. And my latest one that I received yesterday from my aunt. As many of you know, I really want to travel to Japan one day. 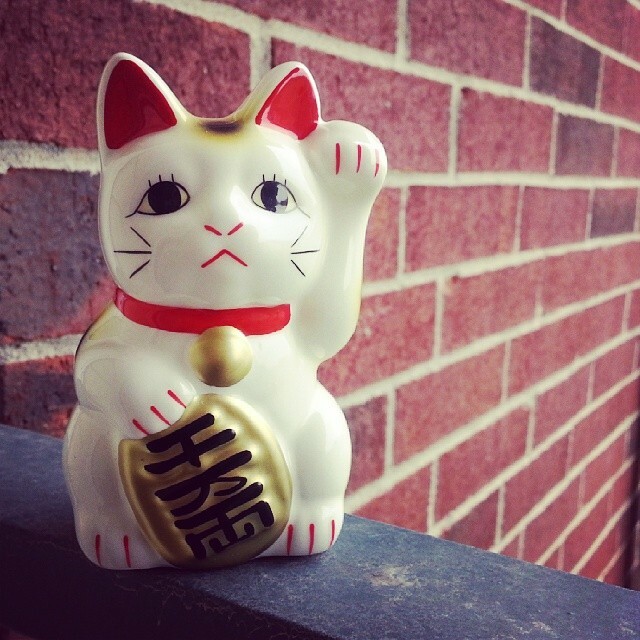 She was just over there, so she brought me back a Maneki Neko, a.k.a. Fortune Cat, Lucky Cat, etc. You can read more about it from this article: 5 Interesting Facts About Fortune Cats, but I am sure it will fit right next to my “All You Need is Love…And a Cat” paperweight. So do you have any trinkets that inspire you? How do they inspire you? Do you think trinkets can help you throughout the day? Do you think they can hold good luck or good fortune? Be sure to share your thoughts and stories below! You never know. Your good luck trinket might help you get picked out to be April’s guest blogger.